In this tutorial I will discuss the interfacing of LM35 Temperature sensor with ARM Cortex-M3 LPC1768 Microcontroller. 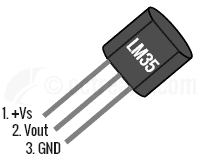 LM35 is a well known low cost temperature sensor and is directly calibrated in Degrees Celsius meaning that the output voltage is directly proportional to Degrees Celsius readings. It has a measurement range is between -55°C to 150°C giving typical accuracy(s) of 0.25°C at room temperature and 0.75°C for full range. LM35 Temperature sensor also supports a wide range of supply voltage from 4V to 30V and is available in 4 different packages viz. TO-CAN, TO-92, SOIC and TO-220. Pin 1 (+Vs) is the positive power supply pin, Pin 2 (VOUT) provides the output voltage linearly proportional to temperature and Pin 3 is for Ground. To keep things simple, we will interface LM35 in basic configuration. The first thing to note when interfacing LM35 with 3.3v MCUs, like LPC1768/LPC1769, is that LM35 has a supply voltage range of 4V to 30V. Hence, another supply of say 5V would be required to get proper readings. The second thing to note is that the output voltage has a scale factor of 10mV per Degree Centigrade and this is fixed irrespective of what supply voltage we use apply between 4V to 30V. Hence, the output voltage of LM35 can reach a maximum of 1.5V and a minimum of -55mV when configured as Full Range Centigrade Sensor. When using the Basic configuration we get an output swing of ~0V(20mV) to 1.5V. So, if we use a VREF of 3.3 Volts we get a resolution of 3.3V/4096 = 0.0008056V or 0.8mV since LPC1768 has a 12-bit ADC. Considering that LM35’s typical accuracy at room temperature(25°C) is 0.25°C (worst case accuracy = 0.5°C @ 25°C) and scale factor of 10mV/°C, a resolution of 0.8mV is more than sufficient. For the interfacing example given below, we will assume a voltage reference of 3.3V which is commonly used on development boards. If these connections are not present on your development board please make sure VREFP pin is connected to 3.3V reference and VREFN to reference ground (0V). Now lets go through a simple programming example. As obvious, we will use the ADC block of LPC176x for interfacing our temperature sensor using reference voltage as mentioned above. 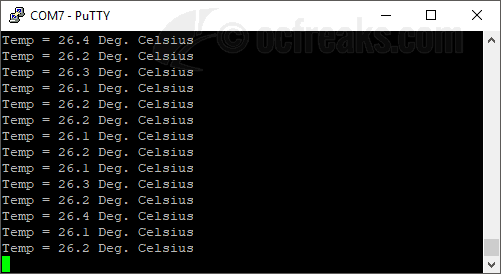 The result obtained from ADC conversion is converted to temperature(in Deg. Celsius) reading using the equations given above. We will use UART0 to send the data to terminal. You can refer my LPC1768 ADC Tutorial and UART Tutorial for more. The example project linked below also contains retargeted printf() for KEIL which redirects its output to UART0. Since we are interfacing with 5V powered device, I have included an optional ADC input protection using a 1K resistor and a 3.3V Zener Diode – just in case anything goes wrong while making the connections or with the temperature sensor. Interfacing LM35 Temperature Sensor with LPC1768/LPC1769 - Example Source Code for KEIL ARM. 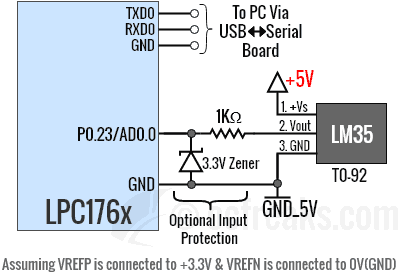 #define VREF       3.3 //Reference Voltage at VREFP pin, given VREFN = 0V(GND) - not used in this example. KEIL ARM uV5/uV4 Project for example given above is on GitHub @ LM35 Temperature Sensor Interfacing with LPC1768 [Successfully tested on Keil uV5.23], Download Project Zip. You can find the HEX file inside objects folder.